Review by Ed Prior. Homeless young orphan Locke Lamora is deemed not "circumspect" enough to make it as a thief. Narrowly escaping a swift death he is packed off to be a disciple at the temple of the Crooked Warden, the god of Fate and Fortune - patron of thieves and rogues. Locke soon learns the temple is a front for an elite organisation known as the Gentlemen Bastards – con artists who fleece the city of Camorr’s richest citizens in defiance of a secret agreement between the nobles and the cities organised criminal gangs. The novel alternates between the adventures of the grown-up Locke, now leader of the Gentlemen Bastards, and a series of vignettes detailing the history of the gang and its members. In the present the Gentlemen Bastards attempt to pull off the biggest confidence game of their careers. Things begin to fall apart for the Bastards, however, when a mysterious newcomer, known only as the Gray King, begins a turf war with Capa Barsavi, the head of Camorr’s criminal underworld. Locke finds himself dragged, very much against his will, into the middle of their war in a fight which will have profound repercussions for both the Gentlemen Bastards and the city of Camorr as a whole. 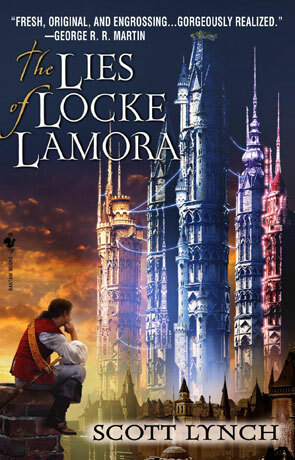 "The Lies of Locke Lamora" is Scott Lynch’s debut novel and the first in projected series of seven books. The city state of Camorr, which owes a lot to medieval Venice, makes for a refreshing setting for a fantasy novel. Lynch gives us a convincing portrayal of this grubby little city full of double-dealing and shifting alliances, as well as sketching out a sense of its place in the wider world. Likewise the description and history of the Bondsmagi and Gentled animals show an originality lacking in much of the genre. Lynch is clearly an ideas man and it shows. The central notion of a group of conmen as the protagonists of a fantasy novel lifts this above much of the competition. Plotting is clearly another strong point of this author. The story here develops organically and convincingly, offering plenty of shocks and surprises along the way. Neither is Lynch afraid to get his hands bloody, don’t go imagining any characters are safe here. Camorr is a hard, violent place where anyone can die and probably will. One minor irritation is the repeated references to Locke’s love interest Sabetha, who apparently left Camorr some time previously and never appears in the novel. Lynch is clearly setting himself up for a sequel, but in expecting us to care about a relationship with a character we know nothing about I fear the author has taken a misstep. That aside "The Lies of Locke Lamora" makes for gripping reading, you’re constantly left desperate to know what will happen next. So why didn’t I immediately run out and buy the next book in the series? The problem with "The Lies of Locke Lamora" lies squarely with Locke Lamora. I just didn’t find him quite interesting enough as a protagonist. A master of disguise, expert at immersing himself in the parts he must play to fool his marks, I found Locke lacking in any distinctive characteristics of his own. The young, brash Locke we meet at the start of the novel soon gives way to an aged, sensible and really rather pleasant chap seriously lacking in bite. Ultimately, he comes off as a little bland, which is a terrible shame in a world this fresh and engaging. Scott Lynch has to be applauded for creating a truly distinctive fantasy world, but in failing to find a really engaging character to place at the centre of it he’s done himself a disservice. Maybe in subsequent novels Locke Lamora will grow into a more interesting and complex character. Maybe one day I’ll read them and find out. Sadly, I don’t think it’ll be any day soon. Written on 27th March 2012 by Ed.